Congrats to Kath from Telford for winning this month’s raffle. She gets a signed, dedicated copy of the latest J&M book. Not ironic, is it, the wee typo in panel 2? I think you mean ‘of’ in the second panel. Nice. Makes you think doesn’t it? It justifies violence in many ways. Ack! Thanks Martin. That one will have to wait until tomorrow. I’ve read it. No equation in it. Not even f=ma and even secondary school children in the 21st century know that! Bit ignorant the author. But that would be expected in the sixth century CE from a despotic murderer. Not all that humble, either. It’s a miracle the more fanatical despots and devotees haven’t set off nukes in the name of their phony god and “illiterate” messenger. Yet. James W, after reading about Tony Schwartz’s experiences with one of his ghost writing gigs ( https://www.newyorker.com/magazine/2016/07/25/donald-trumps-ghostwriter-tells-all ), I’m not surprised that Holy Ghost writer has preferred to remain anonymous. An alternate explanation might be that Holy Ghost writer faked the whole thing (a la https://listverse.com/2010/03/06/top-10-infamous-fake-memoirs/ ). 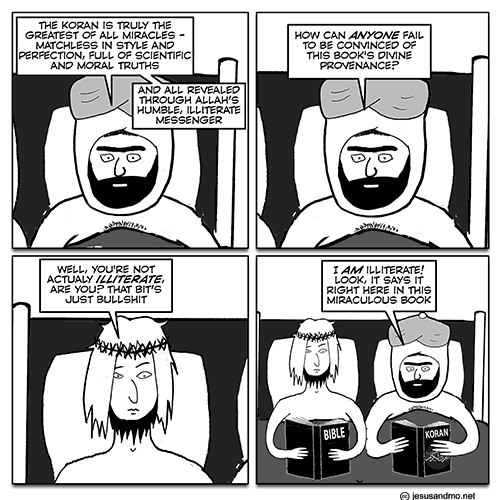 Just curiosity… does it actually say in the Koran that Muhammad was illiterate? Where does that come from? Is it specifically from the Koran or from other Islamic sources (Hadith, Sira, Reliance of the Traveller, etc)? Yes, Koran 7:157 “Those who follow the Messenger, the unlettered prophet, …” There appears to be some room for doubt that the word translated here as “unlettered” really means illiterate. This is just what I get from a casual web search. 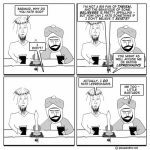 To me it implies that if Mohammed wasn’t up to a heavy writing job, he had friends who likely had substantial input into the output. Not that it matters, right? it all came out how God wanted, or what good is omnipotence? 1. An omnipotent god doesn’t need a messenger, because the god can just put the message into everyone’s mind directly. 2. If someone claims to be a messenger of a god, they’re lying and want something, OR, they’re delusional. & if it has god level powers but is somewhat less than omnipotent it could eg: write it in letters of fire in the night sky. 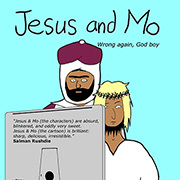 I’ve just finished a fairly unbiased biography of Mo, which finally explained all the “nice” Koran verses quoted by Mo’s many apologists. Mo wrote two Korans, the Original mecca version is poetic, doesn’t threaten folks and is religious in tone. At this stage Mo had few followers and lived in the Arabic version of a sophisticated and tolerant city. violent, full of hate and not a nice book. BUT even though the two books are contradictory they are both perfect hence both must be followed. BUT as a general Islamic rule, later verses replace earlier verses. If in doubt follow the actions of Mo to determine which is correct. Given Mo’s behaviour in his later years the whole horror of proper Islam is easily explained.